A female Killer Whale surfing behind a whale watching boat in the waters off Northern Vancouver Island in British Columbia, Canada. As this female Killer Whale comes up for a breath of air while surfing in the wake of a boat off Northern Vancouver Island in British Columbia, Canada, we were lucky to capture this unique picture. The water appears to fold around the the entire front portion of the Killer Whale as she moves at great speeds while surfing. Peeking out from the foamy white wash is her nose while the white patches on the side of her body appear below the rush of water. The serene water on this particular day off Northern Vancouver Island make viewing the surfing Killer Whale exceptional from above and you can easily seem them below the water. The Killer Whale races along at great speeds while trying to keep up with the boat which is something they seem to thoroughly enjoy. While aboard the boat, you can watch the Killer Whale as it swims below the surface of the water, but be prepared when it comes up for air as the closeness that they come to the boat seems almost too good to be true. Some passengers would rather watch this fascinating behaviour with their own eyes, while others try to be quick with their cameras but miss out on the excitement of the surfing Killer Whale. Surfing is not a common sight while whale watching off Northern Vancouver Island, and if you are lucky to see this type of behaviour, I would suggest that you fully enjoy it with your own eyes. This is an experience that will be planted in your memory forever and the excitement that takes over is incredible. 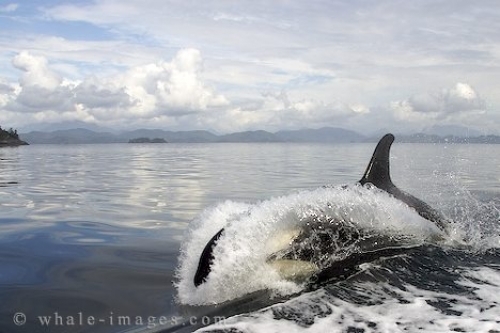 Killer Whale watching is something everyone should partake in if the opportunity arises while on Vancouver Island. It is truly an adventure that you will not forget, especially if you are lucky enough to experience them while surfing in the wake of the boat.